Christmas is in 10 days!!! Are you ready!? I am not at all, I think I am still getting ready for Thanksgiving or better yet, Halloween! This year is flying by! We just got our Christmas tree this weekend and finally got all the lights working. Christmas Carols playing in the background, so I thought this cake would get everybody in the Christmas spirit! 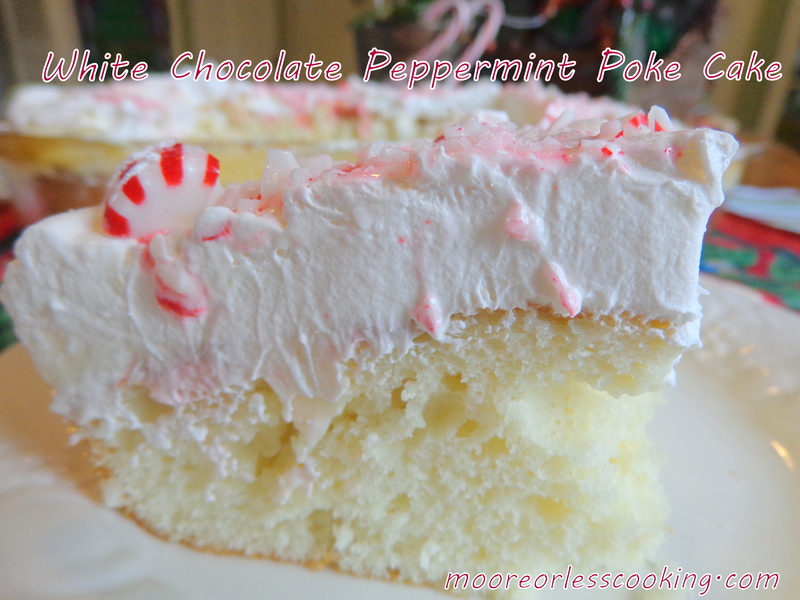 White Chocolate Peppermint Poke Cake! It’s an easy recipe for your Christmas parties or just a delicious cake to have at home! If you have time with all of your Christmas cookie baking to fit this in, you will be so happy! Even my son who said he isn’t that crazy about Peppermint, loved this cake, it is light and fluffy! If you love Peppermint, add Peppermint extract to the Cool Whip. An easy Holiday cake great for parties or for home, light and fluffy festive cake. When cake is completely cooled off, us a wooden spoon's handle to poke holes in the cake. Pour pudding over cake, smooth top. Spread Cool Whip over Pudding, smooth top. While candies are wrapped, hit a couple times with a mallet or hammer, unwrap candies over cake for decoration. Refrigerate cake for 1 hour or until set. Nettie, this cake looks so good!! You have me wanting to go make it right now. Only problem is, I don’t have any cake mix, or vanilla pudding, LOL. This is such a delicious and festive dessert. Love how easy it is and I’m loving peppermint this year. Thanks for sharing your white chocolate peppermint poke cake. The cake looks so festive and decadent Nettie! This looks like something for a holiday party! Love!